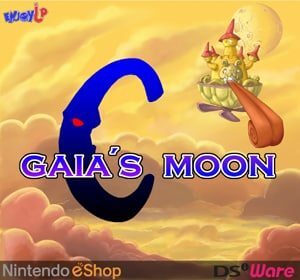 It has been announced that Gaia’s Moon is soon set to release on both Nintendo DSiWare and eShop services. Within the game, developed by EnjoyUp Games, you’ll find yourself in the role of Atreyu and his magical cane Milo, whose help you will need to be able to fly. Something strange has caused changed to the balance of energy in Gaia that is necessary to prolong life, and it is down to you to discover who is behind it and return harmony to the system. You’ll employ the use of a single button to grant you the necessary energy for Milo to allow Atreyu to provide you with the ability to fly through the skies of Gaia. You can also challenge a friend within two-player mode, sharing either the same Nintendo DSi or Nintendo 3DS.